Vanessa Holbrow, from Burnham on Sea, Somerset, and her dog Sir Jack Spratticus has tonight (Sunday March 11th) been announced as the winner of the dog hero competition, Friends for Life, at Crufts 2018. Border Terrier, Jack, had been to four homes before being rescued at the age of 13 months by Vanessa, and he is credited with changing her life, helping her to live with complex mental health issues, by giving her confidence, companionship and stability. Jack, who was selected from the Breed Rescue category, was one of just five dogs to make it to the final of the Friends for Life competition at Crufts, which celebrates the close bond between man and dog and celebrates heart-warming stories of friendship in adversity. 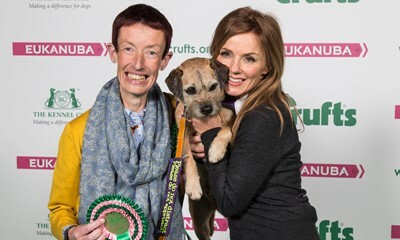 The winner was chosen by public vote and was announced in the Genting Arena at Crufts by Geri Horner (nee Halliwell). Together they raise awareness and breakdown stigma attached to mental health issues. Jack has given Vanessa the motivation and confidence to speak on local radio and write articles for Rethink, and together they have raised thousands of pounds for mental health charities. Jack was accepted by the organisation Canine Generated Independence in August 2017 and is now nearing the end of his training to be an official assistance dog to Vanessa. Vanessa and Jack were presented their award and a cheque for £5,000 from the Kennel Club Charitable Trust for charity Border Terrier Welfare, the charity that rescued Jack. The four other finalists also received £1,000 for their chosen dog charity for getting through to the prestigious final. Caroline Kisko, Kennel Club Secretary, said: “Huge congratulations to Vanessa and Jack for their incredible win – their story is so moving and inspiring, it really shows how dogs can transform the lives of their owners. The five dogs which made the 2018 final were selected by a panel of judges from the Kennel Club, where they were chosen for the lifetime of love and loyalty they give to their owners and for the way that they have irrevocably changed their lives.